almost two and a half years ago. 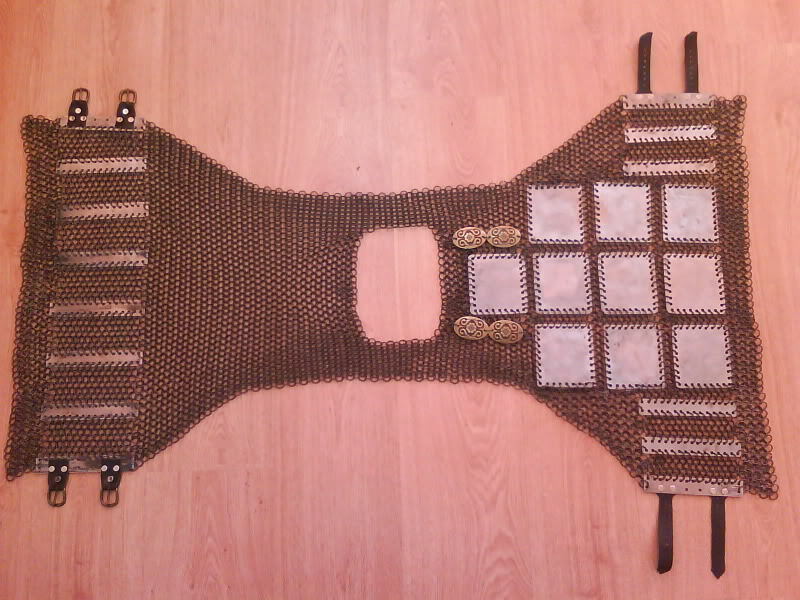 Being not very saticfied of it, last year I decided to make another suit ot Ottoman armour, main item in which is the combined plate-and-mail cuirass, called "yushman". is what I intend to be my future armour. shows how the plates are combined in rows (the center-back row is in the middle of the sketch). So, in the process of my work I will show you the progress of my work and the construction methods in "real time". and he has to separate from it when he separates from his life"
Interesting choice, one rarely sees heavy ottoman infantry kit. I like the breastplate. I found only a helmet Ottoman - XV century - Historical Museum Athens. Not sure about the shoes and the sword. 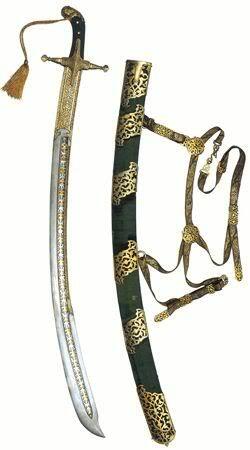 Perhaps only the Byzantines wore a shoulder belt for the scabbard. Please correct if I'm wrong. I can not wait to see something more. I will watch this topic very closely since I am making something similar. 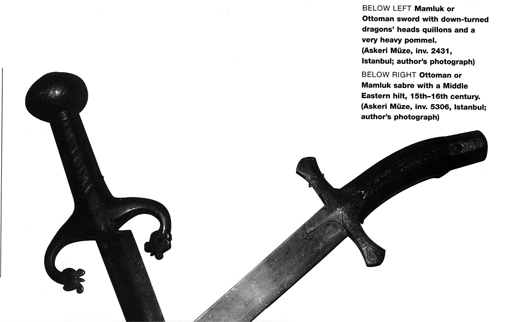 A Kolontar type armor . It's an earlyer version of a maille and plates armor from XIV-XV century. Good choice and work so far! I like the kolontar too, but it was used mainly by the Russians and such armour is not appropriate for Ottoman Infantryman. Is your mail butted or riveted? Because I will use riveted on. For this project the maille is butted. I intend to make a bechter armor (polish/hungarian form of yushman) later and I will use riveted maille then. The kolontar is intended for an irregular Transylvanian infantry kit. I made it with riveted links between the plates. Around the end of January I moved to a new flat and last months I worked quite hard in order to equip my new workshop. That's I was severely restrained to do any significant progress on the project. are the paper patterns for the Yushman. which I will use as a supply depot for straps of riveted rings. The coin (which is Bulgarian national curency) is almost equal in size to 1 EURO coin. Somewhere at this point, I started with the real work. From bottom up: firstly they were drawn and marked; secondly - all holes were drilled; the plates were cut, the corners - rounded and the edges - finished; then the plates were bent and the surface - finished to a smooth satin appearance; and lastly - the plates were oxidized against rust. the order (clockwise starting from the top left corner) is the same. are the almost countless little plates for the skirt - a work done during the "dead" period in which I equipped my new workshop. I can start to connect the plates into desired rows. Very nice work! What are the inside diameter of the rings of mail and the thickness of the wire? Also what are the dimensions of the plates (the height of the rows of plates)? The wire is 1,4 mm thick and the inner diameter of the rings is 8 mm. Obviously, the plates are different in size and shape - the height is constant for all of them (50 mm), but the wight varies from 46 to 146 mm. The plates for the skirt are 98 x 34 mm (big ones) and 50 x 34 mm (small ones). 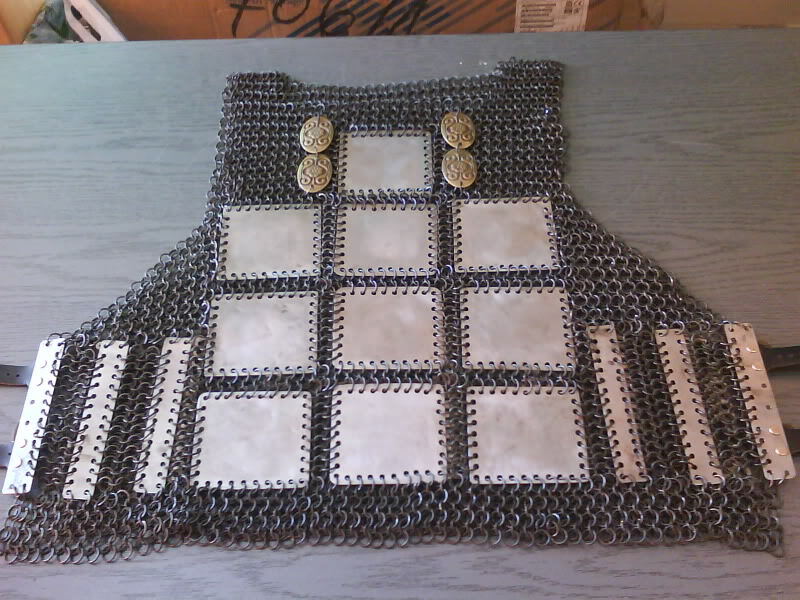 The plates for the breastplate (not shown yet) are bigger than everything else. The height of the central back row, which I managed to assemble today, is 508 mm when fully streched. As you see, there is a great difference between the initial idea and the result. I was forced to re-work the whole breastplate, but although (with bigger plates) it is still quite close to the autentic ones.